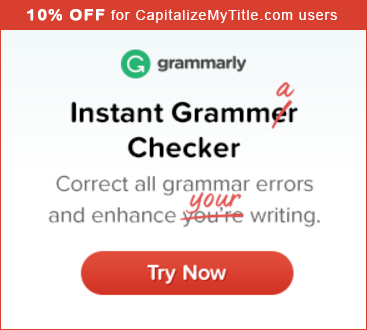 Grammarly is our favorite grammar checker here at Capitalize My Title. We use the Chrome plugin all the time when we’re writing on this blog and writing emails so we wanted to share a little bit about why we love Grammarly so much. First, let’s talk a little bit about what Grammarly is. How Does Grammarly Compare with Competitors? Grammarly is a free online grammar checker that lets you proofread articles, essays, emails, book chapters, and more for common grammar and spelling mistakes as well as typos. You can either write directly in their editor or upload documents you have written. There’s even a Google Chrome plugin that will edit documents and blog posts created outside of the Grammarly website. I used the plugin to edit this post! Hopefully this Grammarly review will convince you that Grammarly is an amazing tool. They also offer a premium service that will uncover deeper grammatical issues and plagiarism detection. I think you’ll agree with me when I say typos and grammar mistakes are embarrassing. Grammarly takes the guesswork out of proofreading. Grammar checking: It has a highly effective grammar checking feature that can greatly benefit writers and bloggers. It has very high accuracy which was quite surprising coming from an automated tool. Integrates seamlessly with Google Chrome: One of the best features of Grammarly is that it works flawlessly with Google Chrome. Simply install the Grammarly Chrome plugin and start letting Grammarly correct your writing across the internet. Proofreading: It can be used to proofread business cover letters and academic papers. It can also be used to edit a novel or a casual email. Proofreading comes free with Grammarly unlike other proofreading tools which are available in the market. Plagiarism detector: Plagiarism checking is a premium feature of the application. It can successfully check more than eight billion web pages when it is used to make documents. This is good for making data both standard and unique. Suggestions for vocabulary enhancement: The application has an excellent database of vocabulary. It gives suggestions to improve the usage of vocabulary as you type. This feature is useful for people who have the habit of repeating some words when preparing documents. 150 critical spelling and grammar checks: Grammarly has an algorithm that is designed to check for over 150 critical grammar checks on documents. This feature is useful for people who are victims of making many mistakes during writing. Furthermore, it has a user interface that is both responsive and very simple to use. This is because Grammarly executes when the user begins writing and provides results when writing stops. Grammarly checks for three main things: grammar, spelling, and vocabulary. Grammar: Grammarly checks your text for over 150 grammar rules (over 250 if you get Premium). It can check everything from subject-verb agreement to article use to modifier placement. Spelling: Spell checkers have been around for a long time, but Grammarly takes spell checking to another level. Their algorithm spots erroneous use of lose/loose, affect/effect, lie/lay, there/their/they’re, and many other commonly confused words. Vocabulary: In addition to the grammar and spell checking, Grammarly will also suggest synonyms that it thinks will make your writing more powerful by analyzing the content as you write. Plagarism: One of Grammarly’s unique features is its ability to automatically check for plagiarism within your work so that you know immediately whether you need to include citations or redo the writing. The Grammarly cost for a premium package is $29.95/month (or $11.66/month if you buy the annual package) which offers additional features you can’t find in the free version or the Grammarly Chrome plugin. Overall, the premium version offers some great features that definitely help people become better writers. Using Grammarly was a breeze. All I did was go to their website and create an account. I also added the Google Chrome plugin when I registered. Once I had an account, using Grammarly was very natural. The interface is very similar to Google Docs. When you first log in, you can either create a new document or upload an existing one. As you can see from the image above, Grammarly does a great job of capturing the key errors. While it is not 100% (it says my use of the word “viola” might be incorrect and could possibly be “villa”), it certainly works well enough. The interface is very similar when using the Google Chrome plugin. Grammarly will check for grammar errors and typos while you type, underlining words and phrases it thinks may have issues. In order to show you how powerful Grammarly’s algorithms are, I have taken a sample poorly written paragraph from an English class website at Penn State University. Wow! Grammarly identified more errors than the human did and actually offered suggestions. Grammarly’s closest competitor is Ginger Software. Like Grammarly, Ginger offers a Google Chrome and Microsoft Office plugin in addition to the online portal. They are also free. In fact, the offer plenty of options for which devices you can use Ginger on including: Windows app, iOS, Android, Chrome extension, Safari extension. I personally prefer Grammarly’s online interface over Ginger’s. Grammarly immediately shows you the errors on the right-hand side of the screen whereas Ginger forces you to scroll over the word/phrase. Hemingway is another app that can be used for checking your writing. However, it does this in a different way than Grammarly. While Grammarly will point out specific grammar issues, Hemingway will focus on the bigger picture of your writing. Hemingway will give you feedback on whether sentences are hard to read and some general stats about your writing, such as how many adverbs you used, but it won’t give you much else. You are on your own to make the corrections it suggests. We love Hemingway as a writing platform, but cannot recommend it as a good grammar checker. Go ahead, give Grammarly a free try and see if you don’t feel the same as me! I hope this Grammarly review has convinced you. Grammarly is a keylogger which captures everything you type in your browser. Google steals other people’s work, such as the tens of millions of online translations that are aggregated every day in order to create the illusion of an AI translation service. I wrote this entire post without Grammarly and you can write on your own too.